Warner’s The LEGO Movie was one of the breakout theatrical hits of 2014. Much like a better Pixar effort, The LEGO Movie is a cracking and original piece of entertainment, which is particularly surprising given that the movie is essentially one giant advertisement. It tells the story of an everyman minifig named Emmet (voiced by Chris Pratt), who’s living the perfectly average LEGO life until he’s mistaken for “the Special,” an extraordinary being who, its prophesied, can save the world from the evil Lord Business (Will Farrell) and his dreaded super weapon “the Kragle.” Much of the film’s humor is rooted in its many pop culture references, though some also arises from a simple familiarity with LEGOs, which almost anyone who’s been a child in the last thirty years (not to mention a parent) probably has. The film features the supporting voice talents of Elizabeth Banks, Morgan Freeman, Liam Neeson, Nick Offerman, Billy Dee Williams, Anthony Daniels, Jonah Hill, and many others. Add to this a catchy soundtrack, featuring songs by Mark Mothersbaugh (of DEVO fame), and The LEGO Movie becomes that rare film experience parents will actually enjoy as much as their kids. The LEGO Movie’s CG animation was rendered in 2K resolution (with the occasional bit of live action footage shot in 2.8K ARRI Raw format) and was finished to a 2K Digital Intermediate. Warner’s Ultra HD presentation features this DI upconverted to 4K. The resulting image offers excellent clarity, texturing and fine detail, right down to the molding lines on individual LEGO bricks, though none of this is dramatically better than the regular Blu-ray. It’s the High Dynamic Range that’s the real eye-catcher here. Colors pop off the screen with much greater vibrancy and subtlety than is apparent in the Blu-ray image. In addition, the deeper blacks and far more luminous brights render a tremendous dimensionality to the image, add a glossy vibrant sheen to the LEGO bricks, and even enhance the translucency of select pieces. The only minor complaint would be that a little bit of color banding is visible from time to time – no doubt the original animation was produced at a 12-bit (or higher) color depth, and converting this to Ultra HD’s 10-bit produced a slight image artifact. Sound is available here in the same English 5.1 DTS-HD Master Audio lossless mix that was included on the regular Blu-ray, which is fine because it’s terrific. It’s hard to image that an object-based mix could improve upon it much. Also included is 5.1 English Descriptive Audio, along with 5.1 Dolby Digital in French (both Parisian and Quebec-dubbed), Spanish (both Latin and Castilian), German, Italian, Dutch, Portuguese, Catalan, and Flemish, as well as optional subtitles in English SDH, French, German (for the Deaf), Italian (for the Deaf), Castilian Spanish, Dutch, Latin Spanish, and Portuguese. There are no extras on the 4K disc, but the original 2D Blu-ray is included in the packaging. 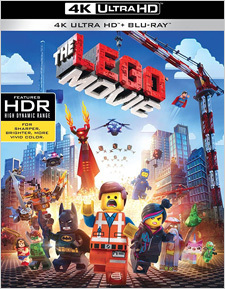 It offers feature-length audio commentary (with directors Chris Miller and Phil Lord and actors Chris Pratt, Will Arnett, Charlie Day, and Alison Brie), deleted scenes (3:20), outtakes (2:33), a collection of behind-the-scenes featurettes including Bringing LEGO to Life (12:36), Stories from the Story Team (4:02), Dream Job: Meet the LEGO Builders (13:28), the multi-part See It, Built It! (approx. 13:00), an Everything is Awesome Sing-Along (3:19), Fan-Made Films: Top-Secret Submissions (3:51), Alleyway Test (:55), Batman’s A True Artist (1:12), Michelangelo & Lincoln: History Cops (1:21), and Enter the Ninjago (2:14), plus an assortment of trailers and TV spots. You also get a code for an UltraViolet digital copy of the film. The LEGO Movie is an enormously clever bit of entertainment, and one that I could even see gaining a kind of cult status with time. While I wouldn’t exactly call this Ultra HD Blu-ray reference quality, the tremendous benefits of HDR on this title make it a worthy eye-candy disc to reach for the next time you’re looking to show off your 4K display to friends.